In this post, we are going to explore the guts of our custom service application, expect lots of code in this post. As I mentioned in my first post in this series, the goal of this Service Application development exercise is to build an infrastructure within SharePoint 2010 for your company to add value to your SharePoint investment, by exposing 3rd party and custom capabilities and features to your farm(s) in a scalable and maintainable way. 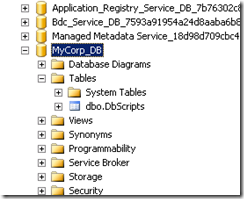 In this post, we will code-up the core components for a service application. In this post, we are going to explore the guts of our custom service application (as usual, the source code is provided at the end of the post). As promised in my last post, there will be lots of code in this one, so hang on tight, and bare with me. As I mentioned in my first post in this series, the goal of this Service Application development exercise is to build an infrastructure within SharePoint 2010 for your company to add value to your SharePoint investment, by exposing 3rd party and custom capabilities and features to your farm(s) in a scalable and maintainable way. I recognize this isn’t for everyone, but if you’re part of a mid-size to big company, I think there is a lot of merit to consider this approach. This is NOT just for ISVs, but ISVs could also take advantage of this (if they aren’t already). Let’s say you have X number of 3rd party systems you want to integrate into SharePoint. 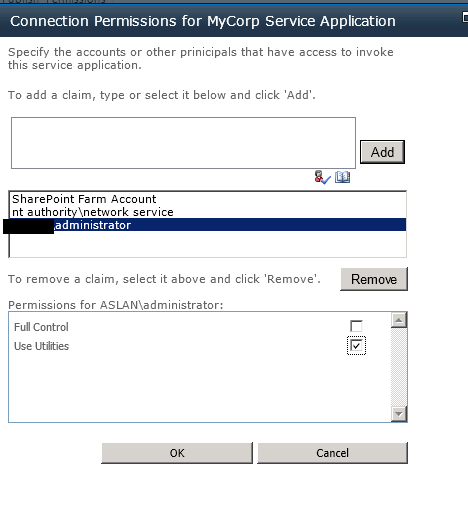 A company service application infrastructure can provide a standard, consistent, and scalable mechanism to embed each system into SharePoint and make it available throughout the farm. You can then also use this same infrastructure to build full custom applications as well if you’d like. In this post, we are going to create the Service Application infrastructure, and in the next post we will embed a sample 3rd party system into the service application and expose it to the farm. The following picture (the Visual Studio solution) illustrates the essence of the Service Application infrastructure that I coded up this week for this post (you can download this at the end of this post). I refactored the code a little from the first post to something that made a little more sense to me. The MyCorp.SP.Core project is a class library full of code that can be used by various development teams that deploy to the farm. This is where we will put some easy to use classes and methods (see the ServiceClients namespace) that wrap all the calls to service application methods using the ServiceLocator. The Infrastructure namespace has some classes for Logging, Caching, Configuration. 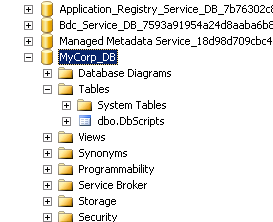 The MyCorp.SP.ServiceApplication project is the class library with all the Service Application code. The MyCorp.SP.ServiceApplication.Server project is the project with the SharePoint specific assets (assets that go into the HIVE). There is too much code to go over in this one post (it was actually a decent amount of work), so I’ll try to discuss the major classes and how it’s all put together, feel free to jump ahead and take the code for a spin yourself. The MCService class is the top level parent object for the Service Application. This class is used to create and update the service application and service application proxy. // application from our central admin UI. 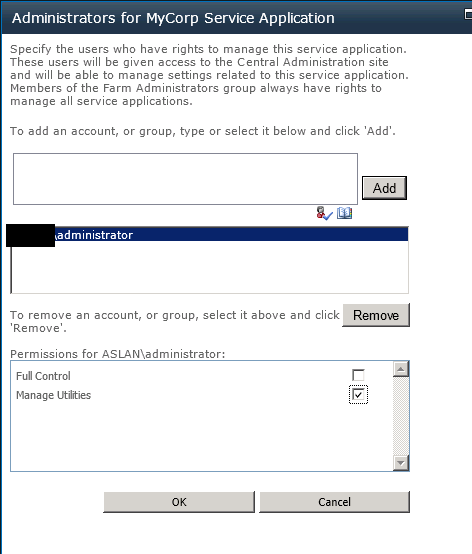 // administrators to modify the service application from the central admin UI. Uses a custom MCServiceApplicationBackupBehavior attribute class (see download) which has some custom backup / restore logic built-into it (recommended over and against implementing the IBackupRestore interface), or you can just use the IisWebServiceApplicationBackupBehaviorAttribute if you’d like. Uses private variables decorated with the PersistedAttribute class which ensures that the variable state is maintained whenever the application is reset/recycled. I tried to add comments throughout the code to explain the reason for certain things, I hope the comments help. Some developers will build business logic into the SPServiceApplication and SPServiceApplicationProxy classes. I prefer not to. 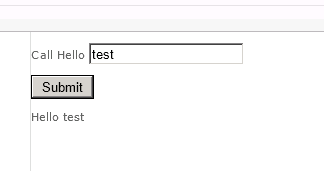 I like to put the business logic in separate service and manager classes, I’ll show that later in this post. These classes are also very important for the correct functioning of the service application (I describe them in the last post of this series). The code for these classes is not really complex, so take a look at the download for more details on these. This is a custom class I created that simply has generic methods to easily access the primary service application classes that may be running within the farm. Again, take a look at the download for more details on this one. Now this is a pretty cool class IMO. This represents a custom database that we want to include as part of our service application. Service applications don’t have to have databases, but having one can really be useful as you might imagine, because you can store any information you’d like in it, scale it however you’d like, mirror it and let SharePoint handle dispatching requests to the appropriate database as needed (for failover purposes). The way I like to structure the database implementation in a service application is by leveraging SQL scripts deployed to the hive (and keeping track of the scripts that have been executed in a custom DbScripts table in the database). This way, whenever you want to add functionality to your service application (as-in when you are building a new custom app within the service application, or adding some extension points for yet another 3rd party system), you can just drop SQL scripts into the hive as part of your deployment, and the service application will automatically read them in for you. Checks a SQL directory for new scripts to run on Create and on Update –> In my implementation the first script in the directory should have the CREATE TABLE DbScripts SQL in it. The code download is already setup for you to install and run with this implementation. Allows for many endpoint addresses by doing a simple string.Replace on a phantom svc endpoint address (this allows us to have many endpoints within the service application and grow the service application as big as we need to). 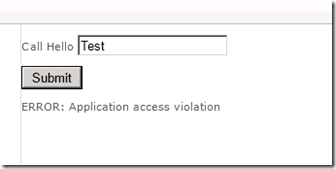 Each endpoint can have different binding information in the configuration as needed. 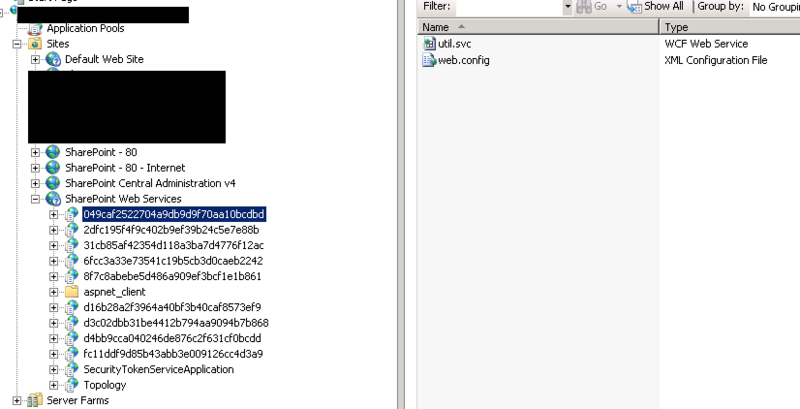 A sample WCF service implemented within the service application. The service application can host as many services as needed. These are sample implementations of the MCServiceClient. The Utility service is 1 service within the service application. This was a lot of code, and we’re not done. We still need to create some UI and show how client code will connect and use the services exposed as part of the service application. But I’ll do that in the next post. But for now, I created some code as part of the Service Application Server project, in the Feature Event Receiver, to show how to provision and unprovision the service application. This will do all the work to create the service, service instance (on the local dev server), service proxy, service application and service application proxy, IIS application pool, database, and WCF service endpoints in IIS. // calling the SPFarm.Local.Services.Remove method. 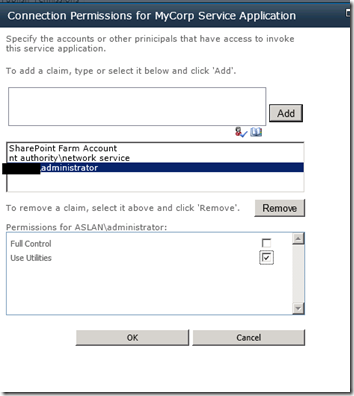 And we can now see the service application deployed in our SharePoint installation. Because we haven’t yet given anyone access rights to the utility service, we should get an access denied, which we do. Exactly the error we were expecting! 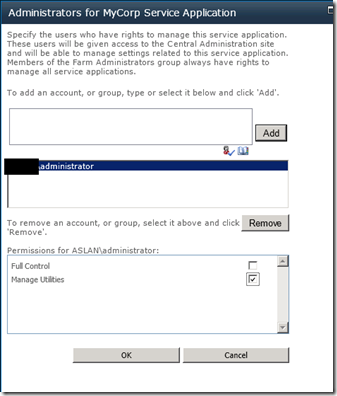 In the next post, I’ll finish the admin property pages for the service application and service application proxy, add some SharePoint CmdLets to manage this custom service app, and in my final post I will integrate a 3rd party service into this service application and show how one could leverage the service app within the SharePoint farm. If you are reading this, you are AWESOME! You hung in there! THANKS! Drop me a note/comment, feel free to take a look at the code. I’ll keep updating the same zip download as we move forward. Thanks a lot for sharing these great series of post on Custom Service Applications. I also had to create a new custom service application and with all the basics implemented it was working fine for a while. After couple of redeployment and testing suddenly my application started failing. And i stated troubleshooting with a very basic hello world method that will return a string. But still it was failing. Return service url from the Load balancer is correct and i can verify it through browser. I found another post explaining the same issue, but i have done all necessary as explained in this post. Can you please let me know what may be wrong that I’m doing? How do I reference the Microsoft.Sharepoint.Administration and Microsoft.Sharepoint.Security namespaces? Where do I get the DLL for those? Thank you very mutch for the answer. You are right.. those are fundamental components. I still have a lot to learn and I REALLY want to do this. The next weeks i will dedicate my freetime to this – i hope it is ok if i get back to you from time to time. I understood the basics. To deeply understand what is going on, I need to get my own work into it. It is a very elegant and nice solution – but for me it is not a 101 because I can not find a starting point. What is needed – what are nice extras? The Problem with a not so basic-solution: I need to learn every bit of the code – after that i know if I need it or not. Massive overhead for a starter like me. I have ServiceStack, XSockets, Node.js(on IIS) and WCF Services. Some Services use SQL, some use Redis, other use MongoDB – they are all working & tested. It would be the so GREAT to use them in a SharePoint infrastructure – for me this is the marriage between work and hobby. In my opinion, you need to start a bit more basic and build on that. Thanks for this great feedback! Here are some thoughts in response. My goal in this series was to provide a basic, but comprehensive look at developing a service application with the essential components needed to cover most scenarios a development team might need. I state this is a 101 because it’s a basic overview of the fundamental components and how a base solution would be structured to accomplish the task. That said, building service applications is not a 101 task in itself, and that’s why in my first post I present this mostly as a viable architecture for ISVs and mid to large companies who can swing the development expense. That said, I think it is perfectly appropriate for any SharePoint developer to take on as it really immerses you into one fundamental aspect of SharePoint architecture and thereby gives you a better understanding of how all the SharePoint service apps work. Doing this as a hobby project is how I built my first service app 3 years ago, and even though that was 3 years ago, my experience is that very few developers have attempted to do this still at this time. It pays off though, as one of my clients for example has developers new to working with SharePoint directly successfully adding features and functionality to their SharePoint farm by adding services using this architecture, and is focusing on UX design for front-end work to consume the services. There are some other 101 examples of service applications posted on the web that can help as well (like this calculator service, this sridharserviceapplication, also here, the Wingtip service, and the autocompletedemo). While you won’t build a service app overnight, simply ’cause it takes time, thought, optimization, I think it pays off.